“My family moved to Townhill Park in Southampton in the summer of 1968, and my Mother lived there for the last 45 years of her life. During my adult life I always returned to the area, but my daughter knows no other home. Townhill Park is a council built estate constructed over 50 years ago and has been labelled ‘For Regeneration’. This project has rumbled on since 2012/2013 when it was first announced, with little or no advancement until the second half of last year when Plot 1 started construction – a combination of 6 family homes and a block of 50 apartments. This plot is being built by Southampton City Council and will be social housing offered at affordable rents. It was this ‘so called’ regeneration that brought me to the table of SO18 Big Local. It was during a 2015 meeting of a local residents' group that found myself, Barbara Hancock (SO18BL Community Development worker) and the Council’s Townhill Regeneration Project Manager in the same room for the first time. "It wasn’t until I had chance encounter in my local supermarket in July 2017 with the regeneration project manager that I found out the demolition timetable had changed again." Residents knew nothing about what they were planning and I couldn’t help but be vocal about that. We have lives to organise, plans to make for the future of our children. Was it worthwhile buying new carpets, decorating or buying new furniture? Didn’t the Council realise this? What about vulnerable young families? Would the 84 year old lady who has lived in the area her entire life be able to move into a one bedroom flat across the road – or will she be relocated elsewhere? That’s not to mention all the other, less obvious ways the regeneration is already having an impact. The local school is worried about what happens to its funding if all the kids are relocated elsewhere. The council are using the empty homes as short-term accommodation for homeless families, but moving them on before they have time to settle because the block is lined up for demolition. I’ve lived here most of my adult life and the future has never felt so uncertain, and the present so unstable. The geography of Townhill Park may help you to understand how this regeneration was going to happen. I say was, because it has gone through many iterations since it was first announced. The name of the area hints at the terrain - hilly! The first plan was to start at the top of the hill with Phase 1 and then roll this regeneration juggernaut down through the estate with further phases, finally ending at the bottom of the hill - literally. In terms of layout, a main road runs the whole length of the estate with evenly spaced side roads going off it. All the blocks lined up for demolition are a couple of minutes’ walk from the main road, but they are interspersed with small terraces of 2/3 bedroom houses with gardens that are not included in the plans. In 2014, not long after the regeneration was originally announced, around 80-90 families were 'decanted' during Phase 1 of the development ('decanting' refers to the process of tenants and leaseholders supported by the council to find a new homes). However because everything stalled again, the blocks straddling the main road stood empty for years before construction was even started. Within weeks the 'decanting' process will commence once again on 3 blocks of flats (33 homes) that are going to be demolished so a modern village green can be built in their place. Residents are pleased with this aspect of the plans, but they weren’t consulted at any point and they still don’t know where to go to ask questions. "We’re also planning to secure independent advice for residents who have questions they’re struggling to get answers to." It wasn’t until I had chance encounter in my local supermarket in July 2017 with the regeneration project manager that I found out the demolition timetable had changed again. Personally this change of phasing means that my daughter and I will not be moving for at least another 4-5 years (2022/2023) when, under the original phasing we were expecting to be looking for a new home in 2019/20. Our block is now due for demolition at the very end of the regeneration project which means we will be living next to construction sites for the next few years. 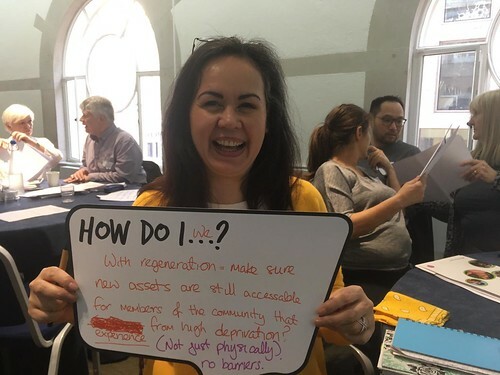 Barbara, with her great wealth of experience in community development, suggested a Regen Forum so everyone working on the regeneration could stay in regular communication with local residents. We’ve held a number of these already, with another planned for June. We hope they reassure everyone who is stressed and uncertain about having to move by making them aware of what’s going on. We’re also planning to secure independent advice for residents who have questions they’re struggling to get answers to. The relocation system is very complicated, and it is mostly delivered online – something many residents can’t access. We have regular ‘Tea and Tech’ drop-ins that we’ll use to help people work out their next steps. At the moment we’re just having to sit tight, and deal with each new hurdle as it comes.